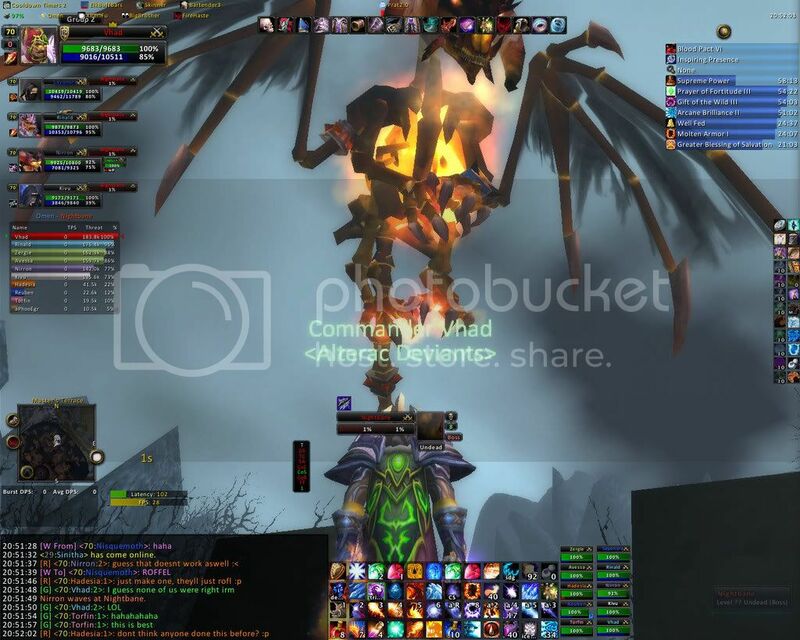 The first kill of Nightbane was on January 30th by the guild 'Death and Taxes'. Summon boss in Karazahn..hardest boss if I'm not mistaken. This guy appears to be the Jin'do of Karazhan- harder than the 'last' boss, optional, but unlike Jin'do his loot is (I think) better than the 'last' boss', so nobody's going to blow him off. So, basically Jin'do if they switched his loot table with Hakkar's? I think that killing him is also required for Serpentshrine Lair attunement. He's drops one of two quest items for the quest The Cudgel of Kar'desh which is needed to enter Serpentshrine Lair. The other quest item is from Gruul. You get the quest in heroic slave pens and to summon the boss himself you have to do the long questline you get from outside Kharazan. The quest for summoning Nightbane is a long chain that begins with http://www.wowhead.com/?quest=9630. The 2 NPCs you have to talk to are in the large room after Curator. Medivh's Journal drops from Shade of Aran. Enter from the side entrance and you should be able to see a door under the broken stair. Read the book there and watch the event. The Charred Bone Fragment is outside North of Karazhan. You can't pick it up while in a raid though. Bring it to Area 52. Book of Forgotten Names drops from Darkweaver Syth in heroic Sethekk Halls and Tome of Dusk drops from Grand Warlock Nethekurse in heroic Shattered Halls. Use the Blackened Urn where you read Medivh's Journal and it will summon Nightbane. Kill him to get the Faint Arcane Essence for the quest. Once you've completed the quest summon chain, can you summon him any time you go to the instance? If so, do you need to get the urn every time from the lady in Area 52? You can summon him any time, the Urn is not used in the summoning process and you don't have to get a new one. Oh yeah; only one person needs the Urn. He's a 2 stage boss (or, if you look at each repetition as a new stage.. a 7 stage boss!). He's certainly difficult, but the main trick to him is learning how to survive phase 2. Do the urns get consumed? And if so what happens if everyone in your guild/server use up their urns? no more nightbane forever? They are susceptible to frost nova and shackle undead, immune to fear/terror effects. (eg. deathcoil) The recommended method of handling is with 2-3 AE classes. If shamans are present, fire elementals help heaps. After you initiate the summon, it takes him 30 seconds to land. He should land sort of in the middle of the ring. You should see a small skull on the ground - that's your landmark for the MT to pick him up. Tank him with your back to the railing - Nightbane should be about a third of the way into the dome. At the start he's pretty easy to deal with. He has the usual dragon fear, so stance dance, fear ward, etc. to avoid that. Melee has to hit his sides - he has the tail whip. He will also breathe fire - hopefully only on the MT. The biggest thing to deal with are the Charred Earth "void zones". You want to stand on the edges of the walkways so that there's room to run around them. In addition, if you stand at max range, you can avoid the fear. Melee has to watch out, though. Every 25%, he will fly in the air. This wipes his aggro. A healer, preferably a paladin, should start to heal to generate threat. In addition, Rain of Bones will fall on one specified (debuffed) target. The skeletons will also start spawning in a series (not all at once) on that person. Nightbane will also fire away at the highest threat person, and it can be mitigated by armor. Therefore, keep the Rain of Bones person up, the person eating the fireballs up, and assist train or AOE down the skeletons. You have about 30 seconds, maybe a minute, to take down the 5 adds. Nightbane will then yell and land. If the MT is facing him into the dome, Nightbane generally lands on the MT's right (where you start walking in from). As such, the raid should be on the MT's left. In addition, you want a hunter doing Misdirection to give the tank some aggro so that Nightbane doesn't breathe fire on the raid. The most difficult parts of the fights are the transitions. It is a very chaotic time, and everyone has to watch out for themselves. It is also a long fight - 13 minutes or so, and mana users have to act accordingly. Good luck! It's a tough fight. The Nightbane fight sounds very difficult to explain, but in a few words it's not that hard. When you use the Urn to summon him, as explained in the quest line, he will land on the skull after 30 seconds.This is announced by "An ancient being echoes in the distance..." . Before he lands, make sure everyone is in position, meaning the tank and the rest of the raid. * Bellowing Roar : the bellowing roar is announced by a ground shake. It has a 2 second cast timer and usually happens at sharp values of threat gained by the tank. By that I mean 20, 25k, 30k and so and so on. If you use a threat meter such as KTM (http://wow-en.curse-gaming.com/downloads/details/4204/klhthreatmeter/) keep an eye on it and get ready to break the fear. You can stance dance/wotf/fear ward through it. If you don't have fear ward available, you have to take 2 things into account : global cooldown and stance switching triggering a 1s cooldown. This means, if you think he will do a roar and fear, best not to use abilities which trigger the GCD (=keep heroic strike/shield block and sunder/devastate watching out for diminishing returns) and wait for the ground to shake in order to break the fear. Sharp reflexes are needed and a lot of luck if it's among the first times doing this. * Cleave - Frontal arc so don't run from one side to the other while he's on the ground. Anyone else but the tank might get one-shotted as it hits for 11000 on cloth. * Distracting Ash - Reduces the range of spells and abilities by 50%. Can be dispelled. * Smoldering Breath - Frontal cone that does 3000-4000 fire damage to enemies in front of him. Deals ~2000 damage every 3 seconds for 15 seconds. * Tail Sweep - 450 fire damage on enemies in a cone behind the boss, knocking them back. Deals 450 fire damage per second for 25 seconds. Watch out for this when he lands. * Smoking Blast every second for approximately 15 seconds. for ~5000 physical damage (mitigated by armor) and ~3000 fire damage over time. This can be dispelled and stacks up to 4 times. * Fireball Barrage: Happens if you're too far away from him when he takes off. Be sure you're not, you're only making it harder. When he lands, he will land on the same place as at first. It will look like he will land waaaay further but don't be tricked and you can get a perfect landing phase. When he yells from above, the aggro resets. If you're casting any heals over time, stop them as the threat generated now might kill you. (e.g. a druid rejuvenation and swiftmend can cause up to 3000 threat, talented or not) and the tank will have trouble picking him up, even with a misdirection. He will land on the right so people will have to position themselves on the tank's left, meaning on the door side. The transitions are the hardest. To get a perfect landing : he can and will fear as soon as he lands; it can be really hard to break this one because it does not appear on any casting bar and you can't tell if the ground is shaking. After you've experienced him and have enough gear to take the damage, you can stay in berserker stance before landing in order to break the fear asap. It’s very easy for a tank to stay in Berserker stance as he lands from the flight phases only, not his first land, and stance dance through the fears also tremor totem does break the fear. Alliance side you have Fear Ward and now Tremor totems as well. A lot of guilds struggle through the bone adds, we happen to use our off-tank (usually feral druid) to group them up and keep agro off the healers. This helps tremendously and makes the fight less chaotic. Also you can dispel the flame debuff off of people to help with healing. You can also dps Nightbane in the air while in flight phase if you happen to kill the bone adds fast. A working strategy for "Tanking" Nightbane during the Air Phase is to have a Shaman respec resto without threat reduction talents, and to spam chain heals. This works quite well due to the high ammount of threat it generates, and it helps a great deal to to keep everyone up because the chains intelligently target the people hurt the most. Since we tried this, we havent gone back to using our Paladin for this. He has a very large collision radius just like Onyxia. Meaning that melee dps can hit him from several yards away, making it a lot harder for you to get feared into a cleave or tail swipe. Another benefit is that if you get charred earth on top of you, you can always just move closer to Nightbane (to where you would be on a normal mob) and continue to dps. As for ranged dps, you can keep attacking him even through the wall so don't worry about los and just keep your distance. Both of these things help a lot with positioning even in a cramped space like the Master's Terrace. If you use the urn after you kill Nightbane as of 2.0.10 patch, you'll get stuck on the balcony. As of the 2.1 patch, Nightbane has had his damage output reduced, primarily on the "charred earth" ability. During the flight phase of the encounter, "rain of bones" whilst still targetted on a player, will not follow the player if they move. Fears are also much less frequent. As someone who likes difficult raid bosses, I'm a little disheartened. Firstly, I'm an Alliance member, and yeah, we have Fear Ward. Secondly, I never got to try him prior to the nerf. Did it for the first time last night, this had to be, by far, the most irrelevant encounter in all of Karazhan. He's like a retarded Nefarian. The damage output on the fight is so extremely low it's not even funny. Step 1) Tank + DPS him, try not to fall asleep from his girlish swings and the fact that he seemingly turns off auto attack during the fear (...). When he uses Charred Earth, do the daunting task of taking one step left. Step 2) Move to the middle and have a mage nova + dps adds, heal the aoeers from their minuscule damage. Step 3) Pick up your epics. You don't need to do anything ridiculous like having a Shaman show up with no points in their threat mitigation talent. Take a Paladin, put Salvation on the Priests, have the Paladin turn on Improved Righteous Fury (99% of Holy Paladins will have this post 2.1). Improved Righteous Fury adds 90% threat to all Holy spells (yes, including healing) and -6% all damage taken post 2.0. This will counter act the Paladins natural healing threat reduction, and instead give them a rather large gob of threat above the other healers instead, especially with Salv on. The Paladin will have the threat every time, complete with -66-67% melee damage. :) If you're trying to take a dig at the raid viability of the Paladin class... don't. That's one area they will always shine in. Since patch 2.1 Rain of Bones doesn't follow the targeted player anymore, it's a static aoe. Did this with a paladin tank tonight, most certainly can be done. Just make sure to have a tremor totem near the tank (we're horde, so no fear ward =p). Also people should be pve specced in the sense that fear resist can wipe the raid if you have the usual 15% from talents. One thing we did is we put up a shadow protection buff on the MT but not the other raiders, not sure if it helps but afaik all fears are shadow based (except perhaps turn undead). WHAT DOES STANCE DANCE MEANS? <I capitalized all letters to gain attention> I don't quite get the meaning of stance dance.. If you have NO fear ward and NO warrior tank you can still do Nightbane we did a Druid MT w/ a Druid OT the OT would run out of fear range and everyone else would run in. He would chew on the 2nd druid until the 1st druid could pick him up again. We did have a shaman w/ the tremmor totem so the fear was shorted and the few times that everyone got feared he would eat the grace of air totem. As I'm MT myself I will tell a bit how to avoid the fear which is very important because not only does he fear and there is chance for others to take aggro, he also walks away from the position you should tank him in if you not react quickly to avoid the fear. If he fears you it can be a problem for your melee dps that could be hurt very bad by the cleave while he hunts you while you are feared, anyway I will tell how to avoid it. It is easiest to avoid the fear as alliance because of their priest's Fear Ward. But if you are Horde you can, only as Undead though, use Will of the Forsaken. Always remember to use it just before he fears because it makes you immune for around 4 sec, so you don't get feared at all. You can also "stancedance" which means you should shift to Berserker Stance quick and make Berserker Rage which make you immune to fear for around 10-15 sec, I don't really remember. Anyway it could seem hard to time the stancedance right, but it actually isn't. With Deadly Boss Mod it announces "Fear soon", so when it says that go Berserker Stance and make Berserker Rage. As druid tank you can use your Insignia/Medallion to break the fear as soon as you are feared. Of course it is easier to be an ally druid tank because they got Fear Ward to but as Horde it is no problem though the fear don't wipe the raid if you don't avoid it - but it can be very evil against the melee dps as mentioned before. Just remember to move him back quick to the position where you start to tank him (exactly where he lands) and remember to turn his tail into the wall. Just to clarify something: when he lands initially (first landing) he *doesn't* land square center of the parapet, he lands about two thirds of the way south - on top of one or both sections of your raid, depending on how you're handling the encounter. Tanks be aware of this and Shield Bash him immediately (he's taunt immune), hunters should as mentioned Misdirect/Aimed Shot him onto you to solidify initial aggro. First time we attempted him it came as a nasty surprise when he landed on top of our "mana cell". Subsequent landings he touches down fairly square centre of the terrace, though. Normal DPS at beginning, until 75%, once he flies up, we all stack on top of the holy priest, once Rain of Bones starts we all move out of it, towards Nightbane (To not cause Fireball Barrage), while we focus fire down the skeletons. 5 seconds before landing, the MT positions himself to pick him up, while the rest DPS down the last of the skeletons. Rinse and repeat. Simple fight. Save your mana, it can be a long fight. Recently, we've been in encounters where Nightbane randomly go after a dps who is not on top of the aggro list. We had KTM to confirm this on several accounts. Sometimes this happens after the fear wore off of the dps, although the MT was never feared and therefore never lost aggro until Nightbane turn around and one-shot the dps. Does anyone else has this problem, or know why this occur? I found out that the best way to avoid fear is to get a boss mod and actually wait for Nightbane to begin casting Bellowing roar and not using berserker rage directly when you see a "fear soon" message. The reason to do so is that the message appears when the cooldown of fear ends, but it doesn't mean that Nightbane will cast it right away, and if you pop Berserker Rage too soon it might wear off before fear and you'll be unprotected against fear when it really gets casted. 1. As a tank you should maintain your Shield Block through all the combat, but especially when you're going to perform stance dance. If you use it, along with thunderclap that slows attack speed of a boss, you'll maintain the block buff even if you change stances, you will block, and you will not get crushed (unless you are VERY unlucky). 2. A common berserker stance -berserker rage - defensive stance macro might be useful but I'd suggest that people not familiarized with this kind of macros (or laggy / low fps ) to not to use them.. the reason is that if you do something wrong or lag out.. you might get to defensive stance BEFORE berserker rage pops (it's a macro not a player, you cannot blame it afterwards :S ), so it's up to you. 3. I use the next method to pop berserker rage fast and safe way. I have Pummel in button 5 normally. When I face nightbane I move Pummel away and put Bersker stance there, and on berserkser bar, I put Berserker rage in the same button... so when I see fear warning I just mash 5 until I get sure BR popped (30 sec CD started counting on :P ). Then I return back to defensive and use shield block... and so on. This method is not the best but... it's simple and works fine. Fear shouldn't be an issue in 2.3. "• Creature AI has been changed to no longer prioritize attacking unfeared targets over feared targets." Which means Nightbane will still be beating on the feared tank, instead of the rest of the raid. Successfully tanked this guy tonight as a paladin with no fear ward. What I did to break the fear was rotate between three things: Using my PVP trinket, casting BoP, and casting DS. For the second two, they were macroed so that double-clicking the icon canceled them immediatley. It wasn't perfect. I had the 5-minute cooldown PVP trinket instead of the 2-minute cooldown; as such, there were 2 fears that I had to eat with only a tremor totem up and someone died on one of them. It was still a successful kill, however, and I plan on getting the better trinket soon. All of these must be doubleclicked for them to work; otherwise you'll still have one of the bubbles on you and nightbane will run off and instagib some hapless clothie. As of 2.3, Nightbane will stick on feared targets due to the AI fear change. However, due to his cleave and breath, it is still important to prevent or minimize the fear on the tank as much as possible. Furthermore, a feared warrior or paladin is incapable of using Shield Block/Holy Shield and would be vulnerable to crushing blows. Having the tank feared is no longer a wipe, but still a risk. Patch 2.3 also distributes (albeit nerfed) Fear Ward to all priests. A single priest will consume a good deal of his fears, while two priests can have a Fear Ward rotation going that will negate most, if not all, of his fears. As melee, we always grouped up hugging his back leg. Out of range of both his tail sweep and his cleave, but still positioned right that Rogues/Druids could take advantage of being 'behind' the target. If you get a Charred Earth below you, you can run straight through Nightbane to his other back leg, while still avoiding both his tail sweep and cleave. It may or may not put you out of range of heals, but it shouldn't matter too much considering you probably haven't taken any damage so far, and you shouldn't have taken more that one tick of damage from the Charred Earth. Rarely he placed a Charred Earth on both sides of Melee. In which case I just backed up and started Moonfiring, if I was a Rogue I would have tried for Deadly Throw; until either one of the Charred Earth's disappear. Jumping or Sprint/Dashing through it to minimize the damage taken. Note that Charred Earth does physical AoE damage, which is mitigated by armor. The tooltip states that it does fire damage, but that is not correct. A hunter pet specced for Avoidance (50% damage reduction from AoE) and extra armor can survive in the Charred Earth for quite a while. Also, Charred Earth is a DoT effect. It takes a few seconds before it actually causes any damage. If you move out of it instantly, you won't take damage. First, you need to have your spell detail level up in order to properly see the Charred Earth effect. If it's really low, all you'll see is some grey smoke. Second, the Rain of Bones does not follow you. As soon as you take damage from in, run out of it. One nice trick I found out by accident: if you are under the effect of a Major Dreamless Sleep Potion, you will not run around while affected by Nightbane's fear. Meaning you won't have to worry about getting feared into his Cleave, Tail Swipe or a Charred Earth area, and restore a nice dose of mana too if you're a caster. As Bellowing Roar is a timed cast you can use it as soon as he starts casting it (obviously you can't use it to break fear after it's already cast). There's one risk to this: a Charred Earth might appear under you while affected. Fairly low chance though, and even then it's unlikely to be fatal especially seeing the potion effect acts as a small HoT. A Paladin using Devotion Aura can help alot, as Charred Earth does physical dmg (Will be fixed in 2.4.2), and helps mitigate the damage done directly by Nightbane. Healers beware: this is a very long fight, especially if you lose a couple of dpsers during the fight. It's easily ten minutes long when you're first learning it, and it's fairly intensive healing the whole time. To compare, I had more healing done on the Nightbane fight during our last Karazhan run (two healer setup, ~9 min fight) than I do during an average clear ofGruul's Lair, trash included. At the end, the two of us had over 600.000 effective healing done between us. I'm surprised no one mentioned this but when the fight first starts he often likes to kill one person if the tank isn't quick on picking him up. He'll land and instantly turn to the side and crush whoever was unlucky enough to be close enough. Remedies for this can include a hunter misdirect, that paladin aoe can help as well. How to survive Nightbane as a Holy Priest - Fade as he's going into the air, spam Binding Heal the entire time Rain of Bones is coming down, and Fade as he's landing. Unless you have loltanks, you'll be alive. From the fact that there are 48 other comments I'm sure the general "How To" has been covered, these are just a few pointers I thought I'd share. Just adding to the discussion about DPSing Nightbane while he is in the air. Been doing this several times now, and the only time I wouldn't recommend doing it is when your gear isn't at least decent (maybe T5 level?). The tank however needs to be cautious and build up rage for when he lands so he can get alot of threat on Nightbane quickly, such as with a shield slam, etc. This is especially effective when you're heavy on ranged. A good tank and a few melee can finish off the adds themselves while the ranged nuke away. Sometimes Nightbane will just land for a short period, then you're already down to the next quarter (75%/50%/25%) and he will fly away again. Should be fire damage as of 2.4.2. Shouldn't change much if you just stay out of the charred areas. Beware, he isint pug friendly. My pug got prince to 1% for nightbane....Well 83% Going to want to go with the guild for this boss. After 3.0.2 this boss has become very easy :) Just 3-manable now. Done it last night with 1 prot warrior (me), 1 resto shaman, 1 mage. all T5 gear. Do not use the rogue talent "Killing Spree" when Nightbane is in the air as you just get thrown off the roof! Just thought I'd drop off a comment here about Nightbane in WotlK..
Major glyphs of Icebound Fortitude, Death Strike and Vampiric Blood. Minor glyphs of pestilience, raise dead and horn of winter. Rune of the stoneskin gargoyle. Frost Presence. No buffs but my own, no flasks, no food buffs, no scrolls. Rotation was IT>PS>DS>HS>HS DS>DS>HS>HS replacing heart strike with vampiric blood/rune tap/mark of blood when needed. No runic power dumps, all runic power stored for higher death strike heals. Stayed out of the fire, used anti magic shell on breath when possible, add phase was easiest part, human racial/lichborne used to prevent fears when low. Last week attumen, moroes, maiden downed with ease, oz went down as well. This week along with nightbane aran and illhoof also were soloed by me. Was using all dps gear, armory is showing the gear i used at the time of this post. Edit: Working on prince, got him to ~30% and was about to pop all of my cd's including army, had done a good job of preserving them throughout the majority of the fight and got insta gibbed by a bad string of windfury procs and parry haste. This boss is soloable as a prot paladin. I used seal and judgement of light, and fire resist aura. Keep sacred shield up, move out of charred earth. I used every man on first fear, divine prot on second, and ate the third. Average 3 fears per ground phase for me. Air phase is the time to regen mana, skellies are easy and can give you a full mana bar from sanct before you kill them. Dispel yourself when you get distracting ash, and dispel the dot off yourself once he's coming back down. Rinse and repeat and he's dead. Pretty boring fight, took me about 17 minutes. PS:what dose the list iteam button do? If you are gonna solo this: use the inner wall to LoS his breath, you got less than a second to react to it and run, but it is possible with some practice. The rest should be easy if you can handle his melee damage. Edit: if you run out of Charred Earth immediately you will not suffer a single tick of the damage. I completed the quest to summon nightbane before they made the urn grey quality (I remember vendoring the urn after it turned grey quality) but I cannot summon him still. Is it because I never got the key to kara? I need to do BM for the key still. Soloable by a feral druid, hardest part was the smoldering breath debuff which I saved my barksin for. I had the urn forever and have ran Kara more than 30 times and now that the Urn is a grey item, I can't summon him. I went into Kara a month ago with a PUG and no one knew the instance, so they didn't know who Nightbane was. I ran around where you summon him but couldn't find any way to summon him. Have they removed him from the game? I'm sad because it takes away from the Kara experience : ( I want to go back and melt Nightbane's face off. He was such a pain of a fight to do because we often had to bring in a third healer. The flight stages were a bit tricky to heal through and often people would get too careless and pull aggro on the skeletal mobs and die. It was a fun fight to do. First defeated by Death & Taxes of Korgath on the 29th of January, 2007. The only boss I can think of from BC onward with dialogue that has no voice-over. It looks possible to solo him as Retribution using SoL/JoL, I got him to his 2nd ground phase and was at 100% hp/mana when he landed. Problem is if he crits you a couple times in a row it'll be 8k a pop and you'll be stuck at 30% life unless you use a CD. You pretty much have to be willing eat CDs like candy, probably 1 per ground phase. Just downed him as Prot, turns out using each ridge of the center wall you can LOS not only his breath, but his fear as well. You can fight him along a flat area of the inner wall, stand near where the wall juts out slightly, and as soon as you see a cast bar, run around the wall. Since it's a semi-circle you can just keep moving along in one direction each cast of fear, breath, or charred earth, and when you get to the end just turn around and go back the other way, skipping any charred earths that haven't gone away. I was taking little enough damage that I could just use SoV as Prot for increased DPS. Beware of pulling him to far away from the urn. It might have been fluke, but as I was soloing him and slowly backing away from his Charred Earth while fighting him, I ended up at the southern end of the balcony, and suddenly at around 32%, he just flew away and I was out of combat. Had to start all over again, and that time, I stayed in the area around the urn. Soloable by retribution spec paladin in dps gear and using a shield and one-hander. Definitely use Fire Resistance Aura, Seal and Judgement of Light, move out of Charred Earth, dispel the debuffs by the skeletons and the one Nightbane puts on you before he lands. Good luck! Requires Servant's Access Door. Supposedly the locked door can somehow be opened after beating the Opera event. So, tried going to this door opposite the balcony that leads to Opera, having just 2 manned the Wizard of Oz event today. Door still locked. I'm surprised after reading the comments here that no one has mentioned it. Also that no item "Servant's Access Key" is in Wowhead database. We sorta wanted to Jenkins the quest and go but now the quest is still on our log. /Sigh. Just 2-manned with a Pala Tank and a Holy Priest, about 5,7k gs gear. No problem at all. I just skimmed through these comments and didn't find anything that answered peoples' questions about summoning him. My boyfriend and I did this last night so he could get rep, we had 5 people in our group. No one could find anything to click to start the Nightbane event. I logged over to my lock, that is attuned to Karazahn and who had the Urn that was used to summon Nightbane years ago. I instantly saw the Black Urn on the ground and was able to click it. So, to answer any questions, you don't necessarily need to have a key to open Kara... BUT w/o doing the old Nightbane quest you CANNOT summon this boss... I'm not sure if it's still available to be picked up. Soloed Nightbane as Bear in mostly itl. 264 kitty gear (GS 6000), 4xT10, some stamina off-pieces and a solo-bear talent spec. Selfbuffed + Runescroll of Fortitude + Lesser Flask of Resistance + foodbuff = 53k hp. I never went below 95% hp during the fight. Fight took 6½ minute. I think the changes in patch 4.01 has made most of Kara - and old solostuff in general - much easier to solo compared to pre-patch (with the exact same gear). Soloed Nightbane as a level 85 frost mage (avg ilvl 346). The key here is to extend the air phases as much as possible and attack him from range. I blew CDs at the start of the fight to get him down to 75% as fast as possible to begin the air phase. After that I rooted the adds with Frost Nova, moved out of their melee range and kept on DPSing Nightbane. When the adds came back I just rooted them again. Rinse and repeat, and he will remain in the air for nearly the entire fight. Note that Nightbane won't die during the air phase; he'll just go to 1 health and you'll have to finish him off when he lands. Took a bit under 3 minutes. August 2011. iLvl 346 Blood Deathknight. I just solo'd Kara. When you become Honored with "The Violet Eye", Go outside of Kara, and pick up the quest "Medivh's Journal" from "Archmage Alturus". After you are done with the quest chain. The quest tells you to "Go to the Master's Terrace, Touch the URN (only clickable if you've done the quest chain) and you will summon Nightbane". I just did it so it is still possible to summon him. I'm curious, if after i turn in the quest will i still be able to summon nightbane, i don't know yet, i'm standing at Archmage Alturus atm about to finish the quest. Since there seems to be a little confusion on how exactly you can summon Nightbane post-shattering, here's what you have to do. All bunched up in one post. NOTE: All this info is about exactly what was needed to be done before in Burning Crusade. The only thing that changed was during Wrath, Blizzard took out the requirement of carrying and using the Geschwärzte Urne in your inventory, which players got after completing all the quests. Instead the urn is always there on the Master's Terrace. A player must have completed this quest line below before it will be clickable for them. This change is what probably caused the most confusion for some players. First off you have to be honored with Das Violette Auge. Doing the Karazhan key quest chain, starting with Arkane Störungen and Rastlose Aktivität, is a good place to start. (You do not get a key from these quests anymore nor do you need one to get in.) You still have to kill lots of trash to get to honored. Probably will take at least two lockouts to get the rep needed. Once you are honored, Erzmagier Alturus will give you the quest Medivhs Tagebuch. This has you go back into Karazhan to talk to Wravien. He and his colleagues are all in the library right after Der Kurator. He will send you to talk to Gradav. Gradav will then send you to Kamsis. If you are soloing Kara this will not be much of a problem. Just watch out for the magic immune Manaschlinger mobs if you're a caster. Whacking away at these guys for minutes at a time is no fun. Level 80+ players should be able sneak past em though. She gives the quest Arans Schemen to get the journal from (who else?) Arans Schemen. After all this is where you get started on the actual Nightbane part of the quest chain. Kamsis will send you to Die Terrasse des Meisters. Use Medivhs Tagebuch at the southern to mid part of the terrace close to the urn on the ground. Then watch the lore all the way through to complete. Go back outside of Karazhan to Archmage Alturus and turn in. (Use the side entrance door nearby for a short cut. If it says locked don't worry it's not click on it and it'll open anyway.) He will have you get a Verkohltes Knochenfragment to complete Die Vergangenheit aufwühlen. It's not hard to get as the bone is right behind the Karazhan summon stone. However, you can't loot it while in a raid group. Either convert the raid group to party (if raid is 2-5 players) from the right-click menu on your player frame (have to be group lead) or drop raid group. If you are soloing, there will not be a problem. Turn in the quest, then get your traveling gear on and tune up that flying mount for the last parts. Now all you have to do is go back inside Kara to the Master's Terrace and kill Schrecken der Nacht. Once there, you will be able to click that urn on the ground you saw earlier. Anyway, click the urn and Nightbane will engage you. He is not, for the most part, a very difficult boss to solo. Stay out of his charred earth on the ground and kill the packs of skeletons when he goes up in the air. At 85-90+, he will not last long enough to be much of a worry. And that might be a problem, because it is possible for Nightbane to die somewhere he is not lootable or bug out if he is killed too quickly. To make 100% sure he will be on the ground when he dies, dps him down to about 20 -15% health and be careful with dots and pets. At this point, Nightbane will be doing his rain of bones two times in a row. Kill the skeletons each time and he will then fly around and eventually land again. Now it'll be safe to put him out of his misery and loot the Schwache arkane Essenz. Finally, go outside and complete at Alturus. You're done! The urn will now be clickable whenever you run Karazhan. Congrats! You can summon Nightbane anytime you want! All of the summoning drama aside, if you want to solo this guy, feel free to keep the hurt on him (DOTS and ranged attacks) in his air phase until 25%. Once he hits that level of health, let him land or face the risk of him dying in an inaccessible spot. If you had previously done the quest during BC, feel free to vendor the Urn as you can now just click the urn on the floor to summon him. What's up with the doors? We killed him in ~3 minutes, then the urn was clickable again, so it was of course clicked. Then we noticed the doors for the first time, and they were closed. So either clicking the urn the second time locks them, or killing him fast keeps you locked on the terrace for ... some amount of time. Edit - Confirmed: As long as both people are able to click it the first time (they've both completed the chain of quests), a second click will re-lock the doors. It will lock you back in after you have killed the boss if you click it again. You will have to hearth out. Edit - Why is this getting downvoted? You will lock yourself in if someone other than the original person who clicked the urn clicks the urn again after the boss is down. The doors will lock and you have to hearth out. I haven't been able to find the urn. Anyone can tell me the location of the so called "urn on the ground"? Make sure you try different angles with the mouse. I was hovering from a distance and only when I came close and after a few tries, was I able to get the cog wheel. A nice GM named Khyterion gave me some tips on the missing mousewheel bug and how to work around it. 1) Do a reset of the zone. So everyone out for a few minutes to 15 minutes. This worked for me. 2) Delete your UI by deleting your account folder. Log out and at least moving it out of the wow directory if not delete your Cache, WTF, Interface. Log in and see if the wheel works. I've done all the quests after being honored, I'm actually revered right now, but I still can't click that stupid URN I'm beginning to hate this boss haha.... I know exactly where it's at and still can't click it any solution to this? As has been previously mentioned, Nightbane is indeed a pushover. When Nightbane lands, Misdirect your (tenacity) pet and DPS him until he goes into his air phase. Whence he's in the air DPS him to 0% and ride out the phase killing skeletons (an Explosive Trap makes this effortless) and avoiding charred earth until he lands, then win pretty shinies! Finally unlocked this fight on my DK...boy, what a freaking annoying fight. Soloed as a lvl 80 Disc Priest, with ilvl 168 gear. Easily done with the 5.0 changes. I finished the quest today and I could summon him. The urn is REALLY small. And near the edge of the walls, near the middle. Got my shield on first try, yay. There might be a bug if you kill him too fast. I killed him today during his first airphase, or rather brought him down to 1 hp. When he landed, he died and then the corpse flew away - so I had nothing to loot. If you've already done the chain and have the urn in your bank (which is no longer usable btw) just to Master's Terrace and click the urn that's at 43, 83. Don't use Shadowstep when the boss is in the air, you'll fall outside of Karazhan and won't be able to get back. It seems as though something is wrong with being able to summon Nightbane. I checked on two attuned characters whilst killing everything in the dungeon and nothing worked to make the urn on the ground clickable. Can you still summon him? To get to him asap, kill Moroes and do the Theater event. Then you can run straight to him and summon him with the Black Urn which is now located as a clickable item on the terrace itself (it's really small and hard to spot but it's really there). On the 7.1 PTR you are currently able to summon Nightbane without having done the attunement. He is still a level ? boss but using the new model. I tried summoning him both on live aswell as on PTR with the same character not having done the attunement. Doing the 'IsQuestFlaggedCompleted' delivered false on both clients. It is hard to say wheather the old Nightbane will be relevant in 7.1 or if they just removed the attunement, so people can farm old Karazhan for transmog incl. Nightbane. Nightbane can now be summoned without being attuned. I tried this myself. I was doing the attunement quests (needed a transmog item) when the pre-patch for Legion hit and NPCs I needed for the quests disappeared. So I put it to rest until 7.1, and found that I could click on the black urn and summon the dragon. Its now a new model on the old Kara raid as well. Can confirm, Nightbane is indeed summonable without ANY part of the quest line being completed. If you kill him too quickly(one shot) he will do a couple air phases, fly around, and proceed to finally land after a minute or so. This is as of 10/29/2016 patch 7.1 on a character that has never even touched the quest line, 20m Karazhan. WARNING: I've been farming this boss for some weeks and never bugged it however I proceed to one shot and wait for the air phase, he landed and I was alt tab afk so he went to air phase again after 1 or 2 mins, I killed him in the second air phase and his body was nowhere to be found, right now im waiting *hopefully* the loot to be mailed by the post master, this is because i'm farming transmog. Just wanted to share that, try to follow mechanics as close knit as possible to avoid possible flaws and bug random bosses in old raids. if you're neutral and just want to start this quest : its possible to kill all boss except Aran, even Prince, its quite some rep, but you still need to farm trash a bit until honored. (I was 5300 friendly after Prince) go back to the entrance, and kill again the animal boss, they are not on weekly reset, but rather a softreset is enough for him and trash to respawn. For those of you who are wondering if you still need to do the questline that will allow you to summon him, it appears they removed it. I went inside the instance on a character that I had used the level 100 booster on, so I hadn't done any quests or reputation grinding relating to burning Crusade. The item that you need to interact with was present when I arrived. This in my opinion is an excellent change for people like me who Farm transmog on multiple Toons. P.S. This was on a normal Kara farm run for transmog gear :) Happy Hunting! Can I bonusroll on him even if I've cleared him this week? just so you all know..the quest givers for this quest - they are gone..the quest can no longer be obtained through regular means..and so it seems if you did not do this quest that..well..unless you form group with someone who has..you will never see origional nightbane or have access to his loot.. I had taken a friend through and killed Schrecken der Nacht with just him and I, and he had got the achievement Eine Nacht in Karazhan but Glimmender Glutwyrm did not drop for either of us. I already had it but it used to be that it gave the mount 100% drop rate to 1 person in the party and you could trade it with anyone who helped to kill Nightbane but I guess they changed the drop rate from 100% down to probably 1%.